In or out of water, divers can’t get enough of the practice. While, ideally, they’d spent every day in the depth of the ocean, watching the underwater world slowly float by, unfortunately this isn’t always possible. Most divers have work, a family and other obligations to attend to, which make constant dive trips too time-consuming and expensive. Luckily, for the times you can’t get into the water, there are more than enough riveting movies that will ignite your diving passions and fulfill your underwater wanderlust. These five films are some of the best showcases of the great blue oceans that can be watched on the screen. By the time you’ve got to the credits, they’ll have you itching to put on your dive tank and roll back into the water. Let’s face it, there isn’t a diver out there who hasn’t created a narrative for the fish they see underwater at some point in their life. Finding Nemo takes this phenomenon to a whole other level. As one of Pixar’s greatest successes, this film is an underwater epic, following a very unfortunate and down-on-his-luck clown fish, Marlin, on his mission to save his son who has been captured by a dentist from Sydney to be put in his office fish tank. Along with the help of an amnesic blue tang fish, he explores the majority of the ocean floor, meeting a plethora of different species along the way. Whether he’s having dinner with vegetarian sharks, hanging loose with surf-nut turtles or attempting to speak whale, Marlin’s exciting adventures are bound to have any diver hooked and wishing they could be right there alongside him. Many James Bond films are left incomplete without the epic and essential dive scene. However, Sean Connery’s underwater battle in the 1965 film “Thunderball” is definitely king of them all. Parachuting in from the sky or driving through the ocean on an underwater jet-ski, the two sites collide in a tense and exciting harpoon shoot out. James’ aquatic gadgets, undeniable style and incredible ability to freedive for a large amount of the scene makes for a classic Bond flick. With a sneak peak of the underwater wildlife in the form of a terrified crab, rowdy octopus and unfortunate shark, who happens to stumble up on the struggle, this dive scene includes everything any diver wants from an epic underwater viewing experience! Also known as the Big Blue, this 1988 title starring Rosanna Arquette, Jean-Marc Barr and Jean Reno is a dive epic like no other. Taking an idea close to many divers hearts—that of becoming part-fish—this film follows Jacques, a childhood diver whose true potential isn’t discovered until a chance meeting with Johanna and an unexpected dive shows that his physical state is more reminiscent of a dolphins than a human. His journey takes him back to the Mediterranean, where his love of the underwater world was born, and re-unites him with childhood friend, Enzo, as their old rivalry is re-ignited. Enzo, now the reigning diving world championship, struggles with the threat from this old friend and the group is pushed into dangerous territory as their adventure unfolds. Diving from beginning to end and a passion encapsulated perfectly in the lead characters; this film is definitely one for dive-lovers. Perhaps one of the noblest diving films on the market, that makes any-one who loves the sport proud to do so, Men of Honor follows the men of the Navy divers training school in their heroic and dangerous quest to become the best and protect their country from the depth of its oceans. Based on a true story, protagonist Carl Brashear, played by Cuba Gooding Jr, aims to be the first African American and amputee diver on the US Force. However, in a time where racism is still common practice, he is forced to go up against many who don’t believe in him to prove he has what it takes. On the flip side, Leslie Sunday, played by Robert DeNiro, is a washed-up and bitter trainer, determined to crush Carl’s spirit and send him back to where he came from. As the film progresses, so does the two men’s relationship, and before you know it, the story becomes one of heart-warming triumph and, combined with more than enough spectacular dive scenes, is a must-see for anyone who’s ever donned scuba gear and flippers. Although not a film, The Blue Planet series by David Attenborough is an essential part of any divers television collection. Nowhere else can you find such an in depth and eclectic collection of information about life in the depth of our beautiful blue oceans. No other program showcases the reasons we dive as well as this series. Available on Netflix, it works as pre-dive inspiration, a post-dive celebration and even as a commiseration to those diving withdrawals when you can’t get in the water. The eight episode series covers everything from coral reefs and artic oceans to changing water levels and the effects they have on wildlife. Including never before seen footage of certain species and practices, it’s everything a diver could want in terms of content and cinematography. Just be sure to remember that if you are planning to watch this on Netflix, particularly if you’re on a dive trip abroad, you may been to use a VPN to unblock the content and gain access to it, as unfortunately the program is subject to geo-blocking. There are so many great dive films on the market, these are just a few of them. If you know of anymore that should be on the list, then be sure to leave a comment below! Author bio: Jess Signet is an avid traveler, travel writer and lover of the open seas. She loves to travel, dive and snorkel and hopes you’ll enjoy these movies as much as she does! Posted in: Dive and Sea Teneife, Diving Newsletter, Scuba Diving. 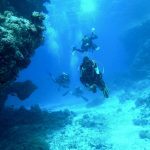 Tagged: Movies for Scuba Divers, PADI Scuba Diving, Scuba diving.